In the Western Premier League on Saturday, Stafforce Recruitment Dumfries dominated their home fixture against Renfrew. Dumfries bowled first and Niall Alexander immediately put the Nunholm side on the front foot with two wickets in the first two balls of the match. Pat Druce followed up with a further two wickets and the Annandale Insurance Man of the Match Alan Davidson finished off any possible recovery with 4 wickets for just 6 runs as Renfrew were dismissed for 51. Chris Bellwood and Scott Beveridge chipped in with a wicket apiece. Three times during the innings was a bowler on a hat-trick – Niall Alexander once and Alan Davidson twice. In reply Drew Dawson hit 23 not out, and Stuart Corbett-Byers was run out for 17, as Dumfries won at a canter by nine wickets in only the ninth over. In the Western Premier Reserve League it was perhaps even more one sided for Nunholm away at Renfrew 2nds, Deanpark. 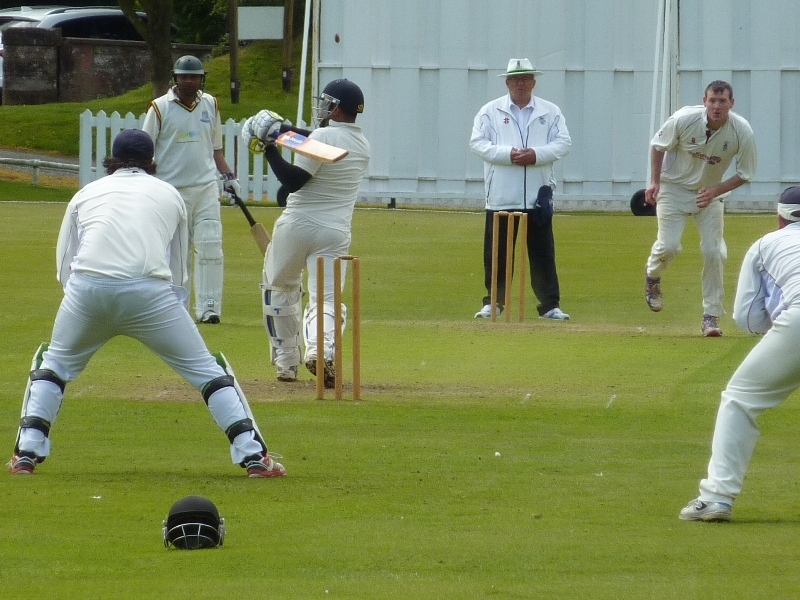 Stuart Alexander also took 4 wickets, for 9 runs, and Fraser Strachan removed two to help dismiss Deanpark for just 35. It was another nine wicket win for a Dumfries side, this time in the tenth over, when skipper Andy Reed then lead the way home with 23 not out. Alexander was the Jardine Funeral Directors Man of the Match for Nunholm. Dumfries’s Chris McBride followed up his 87 against Scotland U17s with another score in the eighties for Cumbria U17s last week, hitting 85 against Lincolnshire in their ECB Championship two day match which was again dominated by the Cumbria side. Holiday Junior Cricket: Dumfries Cricket Club’s Junior Coaching takes place at Dumfries Sports Club on Mondays over the holidays, 6:15-8, for boys and girls, P4 to S1. Beginners are welcome. For details contact Trefor Williams (01387 256455), or the club on dumfriescricketclub@gmail.com, 07799 856094, or see www.dumfriescricketclub.co.uk, Facebook(/dumfriescricketclub) or Twitter(@dumfriescricket). A Summer Holiday Cricket Camp, for boys and girls aged 7 to 12, takes place at Nunholm on 5/6th August (Wed/Thu) again with beginners welcome. For details please use the above contacts. In the Western Premier League next Saturday, Stafforce Dumfries play away at East Kilbride, who dropped from second to fifth after the weekend results, one place above Dumfries with five sides clustered closely together. Nunholm play Torrance House, East Kilbride 2nds, at home in the Premier Reserve League.